To prepare this recipe, start by cutting the sirloin steak into 1-inch cubes. Place cubes in a zip top bag with Simple Girl Vinaigrette Salad Dressing, oregano, salt, and garlic. Close bag, place in regrigerator, let marinade 2 hours or longer. Remove the meat from bag. Alternate placing the tomato chunks and steak pieces onto a skewer. Cook on a non-stick grill for 2-3 mins per side. Note: For this recipe we recommened using firm tomatoes, softer tomatoes will fall apart once skewered. 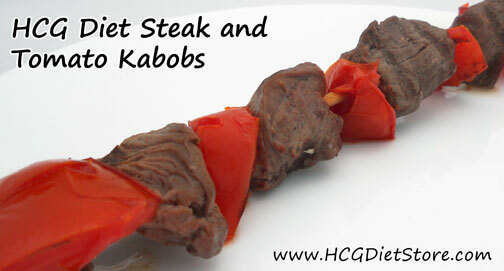 This recipe is allowed on the VLCD phase of the HCG diet (also known as Phase 2 or the 500 calorie phase). This recipe equals 1 serving of vegetables and 1 serving of meat.